Terriers were all over the score sheets in Saturday’s first two games of the World Junior Summer Showcase at USA Hockey Arena in Plymouth, Michigan. In USA Blue’s 4-2 win over Finland, Jake Oettinger stopped 10 of 11 shots he faced over 31 minutes. The only one that eluded him was a bullet off the post from incoming freshman Kasper Kotkansalo. Patrick Harper, along with Ryan Poehling and Joey Anderson formed one of the US team’s most effective lines. A Logan Cockerill goal gave USA White a 3-1 lead over Sweden in the second period, but the visitors rallied for a 4-3 win. Brady Tkachuk, who generated several scoring chances, had put the U.S. on the board early, deflecting home a Chad Krys shot for a 1-0 lead. ►Our man in Plymouth, Neal Boudette, caught up with Oettinger and Harper following Saturday’s games. The two sophomores offered thoughts about making the Junior National Team and stated their strong optimism about the upcoming BU season. ►Freshman defenseman David Farrance has been added to the USA Hockey roster along with Jordan Greenway's brother, WIsconsin defenseman J.D. Farrance is in today's line-up for USA White. "Brady is a big (6-foot-2, 194 pounds), strong power forward," NHL Central Scouting's David Gregory said. "Makes something happen on almost every shift with an excellent compete level. He has very good hockey sense and thinks steps ahead of the play, especially on the offensive attack. He is tough to play against and is willing to go to the tough areas to make a play." ► Goalie Max Prawdzik returns from his semester off from BU, fresh off leading the Lone Star Brahmas to the NAHL Robertson Cup Championship. The 6’3” Andover, Massachusetts native explains his decision to hone his game in juniors to prepare for next season at BU. Prawdzik compiled a 9-3-0 record and 2.14 GAA in 14 regular season games, followed by a 9-2-0 mark with a 1.56 GAA and .924 save percentage in the Brahmas’ playoff run, earning All-Tournament first-team honors. Terrier assistant Scott Young has been tapped by Stanley Cup Champion Pittsburgh as its new director of player development. Young, who returned to Comm Ave as BU’s Director of Hockey Operations in 2014-15 and then became an assistant to David Quinn, rejoins the team with whom he won a Stanley Cup in 1991. And he’s reunited with two Terrier teammates: Pens head coach Mike Sullivan and AHL Wilkes Barre/Scranton head coach Clark Donatelli. In two seasons playing for BU, he scored 65 points, earning 1986 Hockey East rookie of the year honors, before skating for the 1988 U.S. Olympic team. Recently inducted into the U.S. Hockey Hall of Fame, Young played 16 NHL seasons, winning the Stanley Cup a second time with Colorado in 1996. The USA Hockey evaluation camp for the 2018 Junior National team opened on Friday and continued over the next several days, culminating in a three-game showcase with USA facing under-20 teams from Finland, Sweden and Canada. Five Terriers have shots at making the American roster, and I’ll be there just about every day to give Terrier Hockey Fan Blog readers insights and updates on their progress. It was sophomore Patrick Harper who stood out on the opening day, which included practice sessions for the two USA squads – blue and white – and then a scrimmage later in the evening. Harper must be working on his shot because he seemed to score on every other chance in drills in practice. He seemed quicker and stronger on his skates than during his excellent freshman campaign with Terriers (13-24-37). In the scrimmage, he set up several good scoring opportunities with his passing and was slotted on the power play. Also making an impression was in-coming freshman Logan Cockerill. He’s probably a long shot to make this year’s junior team, but in the scrimmage he created a goal by forechecking goalie Dylan St. Cyr, knocking down St. Cyr’s clearing attempt and feeding Sasha Chmelevski for the goal. Cockerill was at home in Brighton during the NHL draft and admitted to being a little nervous as the rounds went on. “I’m happy they picked me up. I’m pretty excited to be part of that organization,” he said. I also caught up with Kieffer Bellows. He said he left BU because he felt his development would proceed more rapidly by playing a 72-game schedule in the WHL. “I’m the kind of player who needs more than 30 or 40 games,” he said. Former Terrier Evan Rodrigues has signed a two-year $1.3 million contract with Buffalo after making 30 starts with the Sabres last season. Rodrigues scored 121 points in four BU seasons, including 61 in 2014-15, helping lead BU to the NCAA championship game. Nine seasons after helping BU to its fifth NCAA title in 1995, John McCarthy told his hometown newspaper in Andover , Mass., why he’ll continue his professional career as captain of the AHL San Jose Barracuda. McCarthy, who scored 45 points as a Terrier, has had multiple stints with the NHL Sharks, including 36 games in 2013-14. 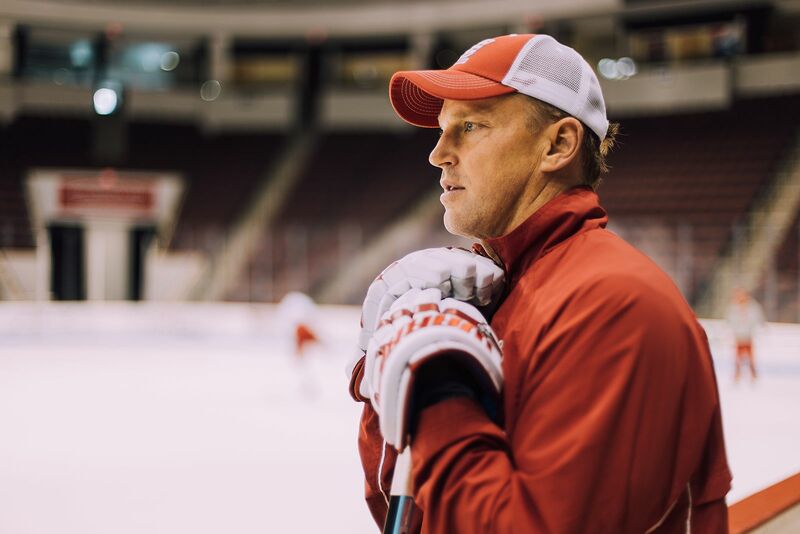 Former Terrier and NHL defenseman Adrian Aucoin has joined the field of former NCAA players who will skate in the August 5 Chicago Charity Hockey Classic, which will benefit the Special Olympics.